Say “aloha” to our new Baggage Bot, the latest self-service feature designed to provide our guests quick and simple answers to their baggage-related questions. We spent a few months training the Bot to handle the many questions we get every day from guests when traveling to and from the Islands. We deployed it earlier this year so it could start interacting with some of our guests during a beta test. Our Bot has been a quick learner over the summer, so far answering over 85 percent of all baggage-related questions it’s asked, so we decided it was time to formally introduce it to our guests! Can I fly with a fresh lei? What are the weight limits for a carry-on? How can I travel with my infant’s stroller? Can I take my lau lau and poke on the plane? How do I transport the fish I caught on Maui to O‘ahu? 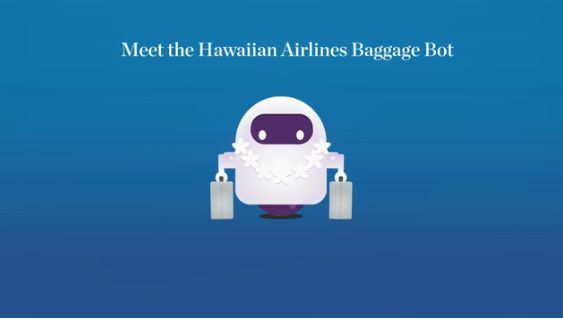 The Baggage Bot lives on the Hawaiian Airlines website or mobile app (under Contact Us) and is at your service 24-hours a day, seven days a week. How’s that for smarter traveling?